‘Best Re-lnvented Attraction‘ by Association of Singapore Attractions. ‘2nd Most Visited Paid Attraction‘ & ‘Top 10 Best Family Experiences‘ by Singapore Tourism Board. Take a train to HarbourFront MRT Station and board the cable car at HarbourFront Tower Two 15th floor, Cable Car Station. Half-hourly SBS Transit New Service Parks 409 available on Sat, Sun, & Public Holidays from 9am 12 midnight. Service loop covers The Jewel Box, HarbourFront Bus Interchange and HarbourFront Coach Bay. Whilst every effort has been made to ensure that the information listed is accurate at time of publication (December 2008). 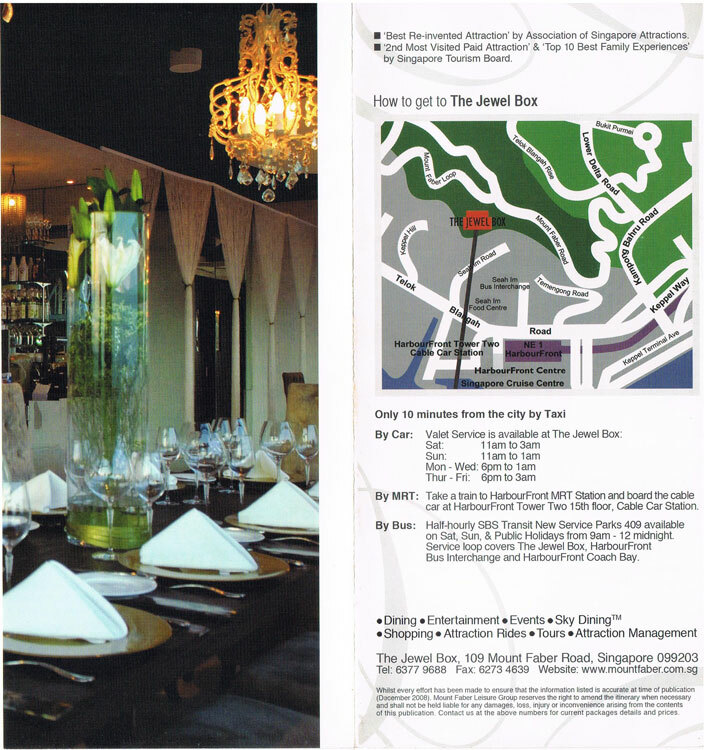 Mount Faber Leisure Group reserves the right to amend the itinerary when necessary and shall not be held liable for any damages, loss, injury or inconvenience arising from the contents of this publication. Contact us at the above numbers for current packages details and prices. Wine and dine in distinction at a choice of restaurants known not only for outstanding culinary offerings but for their stunning setting. Marvel and satiate your palate at the Black Opal. This sophisticated floor to ceiling glass venue has a spectacular harbour view. Enjoy a cosy meal in an intimate setting at Emerald Lodge, set on a beautiful terrace overlooking the City. Relish nature and indulge in snacks and drinks at Moonstone‘s alfresco-style locale. What‘s more, two new culinary attractions set in the pioneering green architectural iconic building are Sapphire, a modern alfresco venue that serves international cuisine and Empress Jade that boasts Singapore Chinese cuisine from world renowned chef Jereme Leung. Combining nature‘s scenery and innovative design, a visit is a definite gastronomic event. of our guests, we have perfected the art of entertainment. Our constantly changing themes and coordinated motifs will ensure that each visit is a new experience altogether. 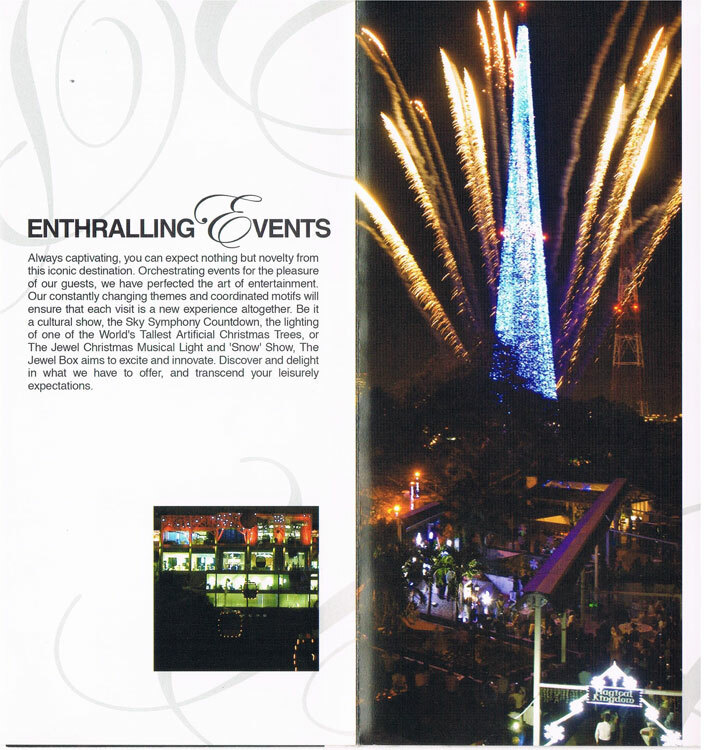 Be it a cultural show, the Sky Symphony Countdown, the lighting of one of the World‘s Tallest Artificial Christmas Trees, or The Jewel Christmas Musical Light and ‘Snow Show, The Jewel Box aims to excite and innovate. Discover and delight in what we have to offer, and transcend your leisurely expectations. inside a cable car. Be starry-eyed with the ideal romantic dinner date for couples who want a pleasant and novel getaway. Those seeking a bold food fare occasion can laze around and view the picturesque Singapore landscape and the scenic setting sun. 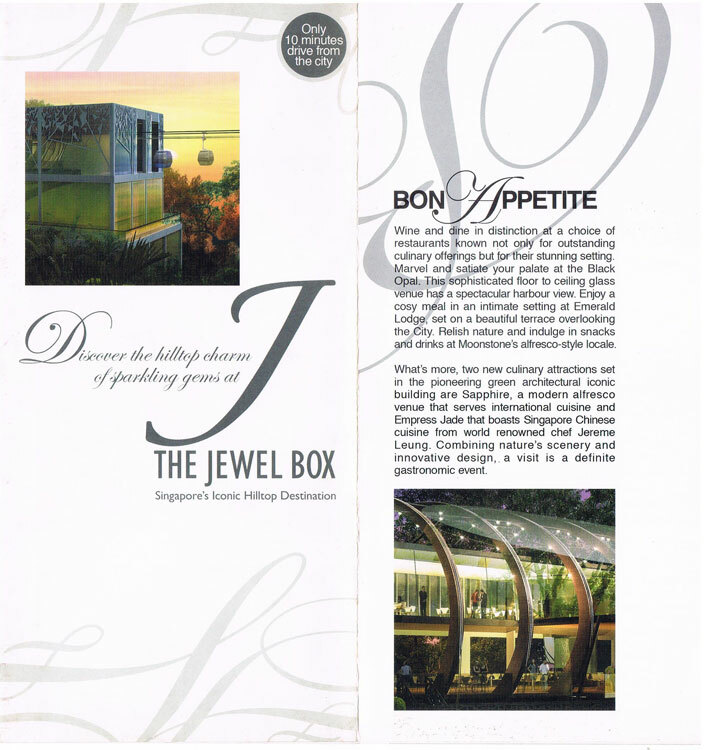 The two-hour long ride traverses through Harbourfront Tower Two and Sentosa before heading onto The Jewel Box. Take in the awe-inspiring sights with equally satisfying spreads and be immersed in an exciting epicurean journey. Satisfy your buying fancy at our many retail outlets. Not just your typical souvenir shops, Faber Forest offers keepsakes and signature products as unique as The Jewel Box experience. Dazzle yourself with twinkling mementos of inlaid jewel boxes that won the Souvenir Award in 2006 from the International Association of Amusement Parks and Attractions. Immerse in the ambience of Faber Forest‘s excellent vicinity for an enjoyable shopping experience like no other. Choose from an assortment of rare gift items and token products. Surely there‘s no better place to shop to your heart‘s content. Our unique one-stop solution serving the needs of the MCE industry begins from the moment you touch down in Singapore. Our coach services can bring you to a prestigious hotel or deliver you straight to our doorsteps. We provide a choice of ballroomsand venues for that all too important event or corporate meeting along with a weIl appointed business centre. 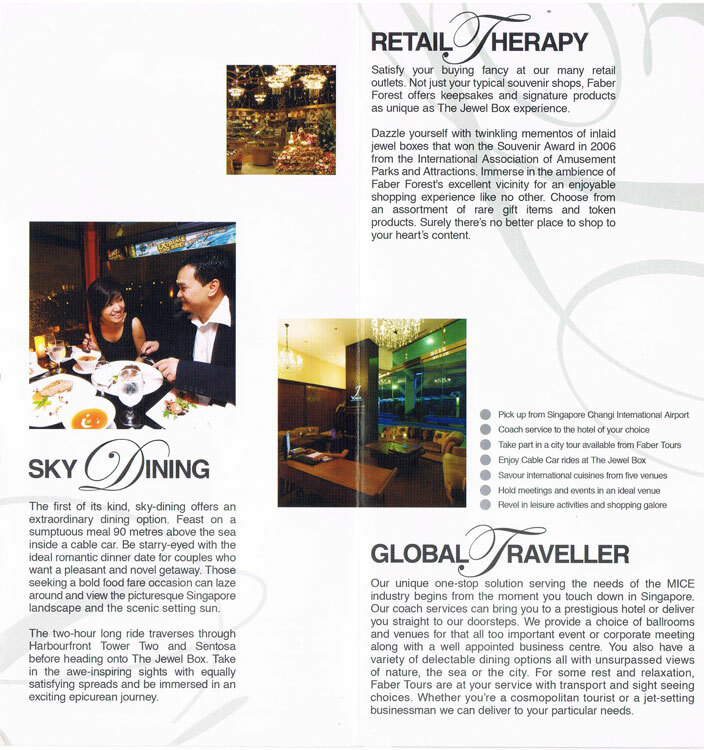 You also have a variety of delectable dining options all with unsurpassed views of nature, the sea or the city. For some rest and relaxation, Faber Tours are at your service with transport and sight seeing choices. Whether you‘re a cosmopolitan tourist or a jet-setting businessman we can deliver to your particular needs.